Hands is the area where your playing cards go when they are dealt to you. This area is where your name is located on the table. 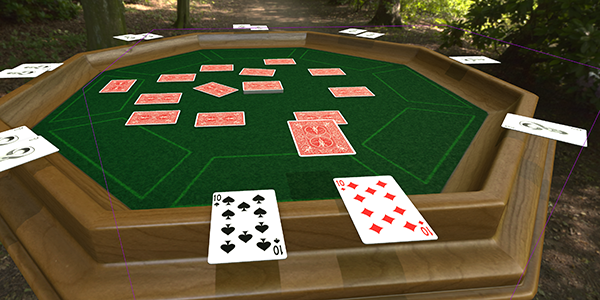 Currently the Hands Zone can hold only cards and dominoes. When you manually bring a card into your hand, a box is highlighted with your player color, so you know the exact size and location of your hand area. Hands are private, so anything you put into them cannot be seen by anyone else. As the host, there are other options you can use to personalize the hands area if needed. Go to Options -> Hands to bring up the window. 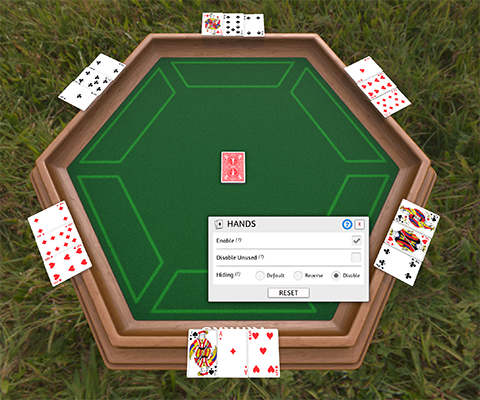 Enable: If you really want to make the most of the table, but don’t want the hands area to keep popping up and grabbing cards when you don’t want them in there, then you can uncheck this box to disable hands completely. If any cards were in the hand when you applied this, then the cards will just drop onto the table. 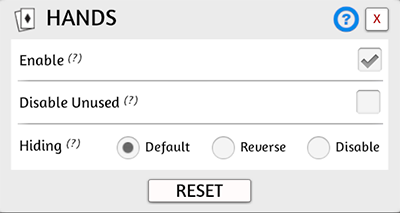 Disable Unused: If you’re only playing with 2 people and have no use for the other hands, then you can check this box to disable hands where there are no players seated at. It’s the same as above, except it only keeps the hands for players who are seated. Hiding: This section determines how objects are hidden in the hands. Default means that you can only see in your own hand. Reverse enables everyone except the owner to see in his hand. And Disable lets you still use hands, but now all cards are visible to everyone. This is a good way to do a mass reveal without everyone doing it themselves. Read about the Hand Zones tool and how to modify it here.